Students will be able to discover some of the basic ideas about food chains. The purpose of this lesson is to activate students interest and prior knowledge in food chains and food webs while assessing misconceptions. Getting students to discuss at high levels is extremely important in a middle school classroom. In this lesson I use a strategy of exemplars and self-rating to make students more aware of the depth of their discussions. Learning Goal: Discover how food chains can be used as a model to understand the flow of energy and matter. Opening Question: How does energy and matter go from one organism to another? Students write in response to the question using their learning goals sheet. I walk around the room to make sure that students are answering the question. I reward students that are working when the bell rings with a ROCK STAR ticket. I use a timer on the screen to manage the time. Today, I had kids share answers with their partners. The purpose of the hook is to generate excitement for the learning of the day. Since this is the first lesson of a mini-unit, I like to start out with something a little flashier than normal. I write the phrase "You are what you eat!" on the board and hand out Oreo cookies to everyone. Together we have an open discussion about what this phrase means and what is actually happening to the oreo cookie. I like to do discussions like this in a circle and have trained the students to move quickly and efficiently to the "Learning Circle" Students are expected to be respectful listeners and participators in the discussion. I hold them accountable by calling on random students to extend the discussion. 1) Not understanding what the arrow shows and therefore getting the direction wrong. 2) Not understanding that the food chain shows energy AND matter flowing through the ecosystem. One way to pre-assess is to give the students a list of items such as, grass, mountain lion, deer, and sun and ask them to use these to make a food chain. For students that have studied food chains and food webs before, I let them choose their own organisms and ask them to draw me a food web or food chain. Students can complete this work in their lab notebook. If you have computer access or student phone use, this assessment can be done as an online assignment. Students can move the pictures and arrows into place and they type in an explanation underneath. Once they are done, I ask them to Think- pair- share with their partners and discuss any differences they see. This simple discussion strategy builds accountability for students doing the writing and thinking. Then I ask students to explain what is happening in their food chain. Generally, I have students that fall into four groups. They don't know what a food chain is at all. They put the items in the right order but get the arrows wrong. They complete the task but can't write about it. The complete the task and write an explanation that makes sense. In the picture below, the student has tried to draw a food web, however they are showing several misconceptions. First, none of the animals or plants are connected to show level, also, the picture is lacking arrows to show direction. 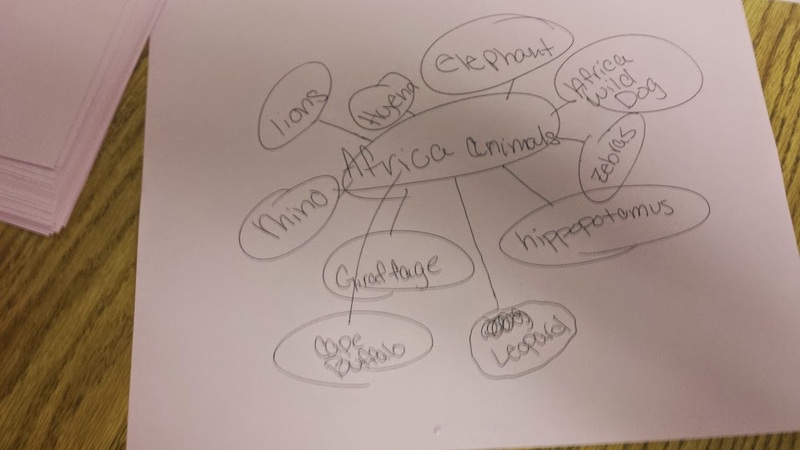 In essence this student has simply drawn a bubble map of African Animals. Answers like this indicate that the students have not already mastered this content and are now ready to learn through the activities in the unit. The purpose of this part of the lesson is to provide time for students to look at a variety of food chains and find and explain commonalities. Often, if they are harboring a misconception, seeing different examples will help them identify and challenge it. I either set the students up with computers or give a group a copy of the powerpoint. I like to have students do this activity in a group of 2 or 3 because it is important to have them talk about each slide with someone in order to make connections. 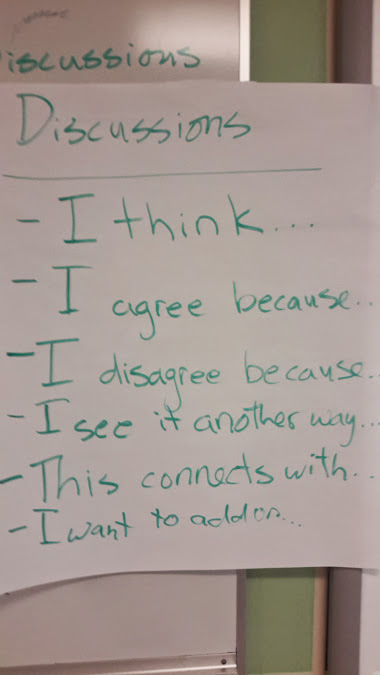 In my class, students use an anchor chart with sentence stems to deepen the rigor and create accountability in their discussions. Then we watch the video that demonstrates good discussion behaviors and together we "notice" what the children are doing. The sound was a little off on the second video, so I added the captions so that students could see what the children were saying. At this point, the students understand what is needed and expected. I ask them to look at each slide in the presentation and discuss what they see and what they think it means. I try to join each group for the discussion on one slide so that I can give them feedback on how their discussions are going. 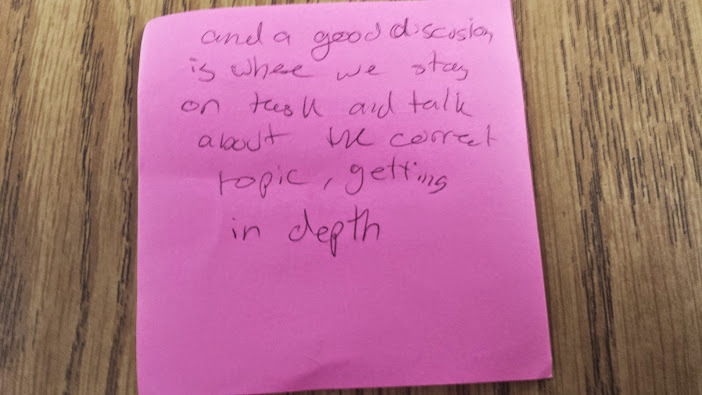 The purpose of this section is to have students evaluate their discussions and plan for how they want to improve their discussions next time. I ask students to get out their Learning Trackers and then decide together what score out of four they would give their discussion. 2- Talked about the topic but didn't use the sentence stems. 4- Used the sentence stems and got deeply into the topic. The key here is that STUDENTS are assessing themselves. 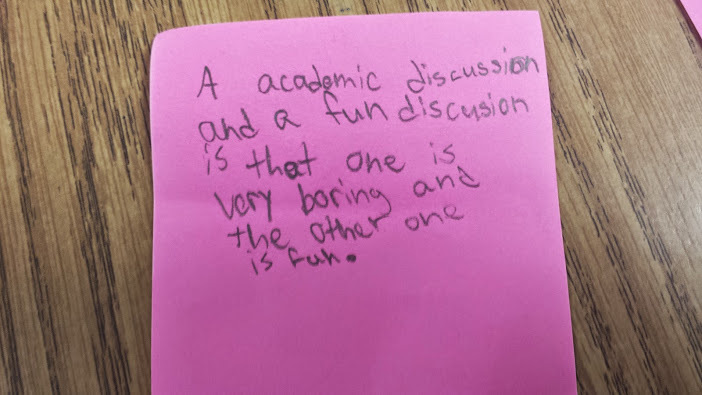 Often, they will give themselves a different grade than I would have, but that's OK, because their next step is to decide how they will improve their discussion next time. I have found that even when students give themselves a much higher score than I would have, their next steps are very accurate. This positive accountability pushes the students more then me putting a grade on them. We end our discussion by sharing out three different ways to improve next time. Closing Statement: "Today we learned about how you are what you eat. Think about that as you have dinner tonight. Tomorrow we will get more into food chains." Closing Question:"Today we looked at food chains and learned how to have better discussions. I want you to think about what made the difference in having good academic discussions with your partner and just having a fun discussion." Below are some pictures of student answers to this question.